Composer Nino Rota was born in Milan in 1911, studied in Milan under Gioseffo Zarlino and in Rome under Alfred Casella, all preceding World War II. He was best known as a film composer, including many collaborations with Fellini until his death in 1979. Despite this background, his harmonic language, at least on this album, is quite conservative and traditional, favoring simple stepwise melodies and neo-Romantic chord progressions. The repertoire included on this CD was all written between 1935 and 1972, and any sense of musical tension or strife in these works is quickly glossed over and replaced by pastoral scenes and light, French-influenced melodies. Three Duets for flute and oboe (1972) employs simple, clean lines with an equal interchange of ideas. The flute stays mostly in the middle and beginning of the high register and the oboe is generally in the same range, creating a sparkling, playful sound. Rhythmical integrity is key in the fast outer movements, when the flute and oboe rapidly exchange fragments and finish each others’ sentences. Five Pieces for flute and piano (1972) is clearly influenced by Satie’s simplicity and diatonic language with perhaps a touch of Debussy’s sense of ambling, uneven phrases and cool, aloof chord structure. Likewise, the Sonata for flute and harp (1937) evokes Ravel in its elegant simplicity. The Quintet for flute, oboe, viola, cello, and harp (1935) also fits into this category, marked by gentle, undulating melodies. The choice of instruments in this piece works very well, and voicing is well-written to highlight each instrument’s strengths. The Trio for flute, violin, and piano (1958) is a rousing, technical fanfare right out of the gate. The playful exchange between voices reminds one of similar chamber works by Bohuslav Martinu, and there is a great energy present in all three parts. The harmonic language is still very accessible, but it does wander a bit more into atonal territory than the aforementioned pieces, adding some welcome variety to the program and allowing listeners to enjoy flutist Mario Cabotta‘s excellent technique. The performance quality on this album is stellar; each musician plays incredibly well as individuals and as chamber musicians. Ensemble is solid on each track. Mario Carbotta plays beautifully in a rich, sonorous lyrical style. Sound quality is just fine on the majority of the CD: the atmosphere is warm and intimate without sacrificing clarity of sound. The Trio for flute, violin, and piano is an exception; the violin and piano often overbalance the flute, which suddenly sounds far away, unlike any of the other tracks. 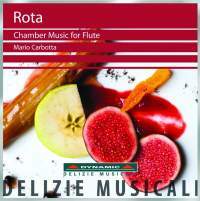 Nino Rota’s repertoire highlights the flute’s lyricism and clean simplicity of sound, and it is beautifully wrought by all of the musicians on this album.